“….Exhale was born out of the last couple of years of my life, God resurrected my very broken life of a dead marriage and selfish heart into a redeemed and reconciled life and Exhale is an album full of love letters to my one true love, my champion, my Jesus who did that. I have breathed in a life changing grace and this record is my opportunity to breathe that out, to share it, to exhale…” Tiffany Arbuckle Lee (aka Plumb) has had an amazing career so far. Releasing her album Need You Now in 2013 after a hiatus for the past few years, and also a deluxe edition of the same album in 2014, this coming week she is back with a brand new pop/worship album titled Exhale. Establishing herself as one of Christian pop/rock’s most creative and passionate artists, and personally one of my favourite female artists; Plumb is showing no signs of slowing down, despite her time away from the stage. Already achieving what many artists would consider a dream, including many hit #1 songs (“Hang On”, “Cut”, “I Don’t Deserve You”, “In My Arms”, “God Shaped Hole”, “Stranded”, “One Drop”, “Need You Now”) and albums in the Christian, mainstream and the dance markets, a long time successful song-writing partnership with Matt Bronlewee, as well as plenty of airplay of songs in movies and TV (One Tree Hill, The Vampire Diaries, Bruce Almighty, Evan Almighty, The Nativity Story); Plumb’s accomplishments are nothing short of remarkable. With the theme of this musically diverse and eclectic inspiring batch of 14 songs being immersing ourselves in our relationship with God and His love for us in our lives; listening to this album is a must for everyone, even more- it is a necessity. This is one of my favourite albums of the year so far, and Tiffany deserves a Dove Award and many more accolades for her efforts! One of my favourite songs from this album is the lead single “Lord I’m Ready Now”, highlighting an aspect in the in depth progression of the marriage of Plumb and her husband Jeremy, as the song reiterates the fact that Plumb and her husband are looking from the other side through reconciliation believing that hope and God carried them through. It’s a feel good story, and it’s a well thought out track to include on this worship project. Driven by stirring keys and inspiring guitar, Plumb’s searing and sublime emotional vocals outline a message of how God weaves through all our circumstances, even the broken and seemingly unfixable ones, for His good. However, seeing the end of the story, how ‘…Lord I’m ready now, all the walls are down, time is running out, and I wanna make this count…’ might not necessarily deepen and evolve our trust in God more, yet if we trust the big picture God is painting and guiding us through, then we can rest in the safety and security of God’s love. The rest of the album is quite extraordinary and exquisite, as it vividly and authentically depicts a faith journey Plumb has been on for a while, displaying her brutal honesty, vulnerability, and God’s handiwork in restoration as she has successfully come through the other side with God’s providence and assistance. The title track emphatically sums up all of what Plumb has been feeling and experiencing this past few years, and that’s why it’s the song that will probably resonate with listeners the most. Driven by stirring electric guitar, this mid-tempo pop/worship melody inspired by personal experience, describing the pain felt from heartache yet at the same time providing us with hope, is the perfect way to open the album, as Plumb asks us all to ‘…just let go, let His love wrap around you, hold you close, get lost in the surrender, breathe it in, until your heart prevails, and exhale…’. Well done Plumb for wearing your heart on your sleeve and bearing your soul to us, even if it is messy sometimes. Creating a worship album with a common theme of a personal experience is something unusual in the CCM industry, yet Plumb effortlessly and flawlessly makes Exhale the exception to the norm. With the title track and the lead single (already aforementioned) leading the way, the rest of the tracks carry on the theme of basking in God’s presence and worshipping him because He is. “Smoke” is led by haunting, mysterious electric guitar, and this slow tempo lullaby like melody has Plumb at her brilliant best vocally, as we can feel the emotion oozing out from her, as she is almost reliving her life being in smoke. But as the chorus reiterates, we learn that ‘…You are my safe place, You are my hope, You are my shelter when it all goes up in smoke…’, which is a much more brighter tone than the verses. With the presence of violins and vibrant keys, we are gently reminded of God’s restorative power, no matter the extent of our circumstances. This theme is carried onto “Resurrection”, one of my favourite songs on the album, with the pop/synth epic orchestral melody highlighting the transformation of someone from death to rebirth. Speaking about our life after we have become a Christian, with Plumb ardently proclaiming that ‘…I believe in resurrection, everything that’s dead will come alive. I believe in restoration, better than before, stronger and secure…’. In the middle of the album, after we hear a few personal tracks, Plumb switches gears into all out worship, which is definitely a good thing! While the all-out worship melody “Great Is Our God”, a cover of Young Oceans’ hit song, is a uninhibited and unashamed inspiring tune celebrating God’s goodness and sovereignty, proclaiming that ‘…and we will seek Him, our Rock and Salvation, morning by morning, with thanksgiving we come…’, and “My True Love” is yet another all-out praise song (a dance/pop/EDM/remix number) as Plumb sings praise to her true love which is Jesus; these tracks are further proof of Plumb’s musical and lyrical diversity and versatility, which is explored in more depth later on. For a voice as beautiful and powerful as Plumb’s, it’s a no-brainer that my favourite songs from her on this album continue to be the slower paced ballads driven by keys to accentuate her voice and bring forth the lyrics and their meaning. On “Faithful”, we are met with a serene and calm piano driven track (which later builds into an epic anthemic guitar led worship song! ), where the unending faithfulness of God is explored, as we hear about the fact that Jesus never leaves us and that He always keeps His promises, that ‘…You are faithful to me, I am not afraid, no matter where I go, You will never leave me, for in You I am home…’. “Broken Places” is another emotional and honest melody, led by some impressive piano work, and also synth loops later on in the chorus, where we are reassured that Jesus is strong for us at all times, even when we are at our lowest, that ‘…You are strong in the broken places, I’m carried in Your arms, You are strong in the broken places, there’s healing in these scars…’, while the upbeat and vibrant guitar led Easter themed worship anthem “Champion”, has Plumb explicitly taking a stand and passionately declaring in no uncertain terms that Jesus has defeated death and that He is her champion, a personal statement we can all proclaim with authority and assuredness! As strange as a title as “Sleep Will Be Sweet” is, as well as musically, as it’s mellow and not mellow at the same time, being driven by haunting and mysterious electric guitar as well as explosive synth and light acoustics; the topic at hand is as relevant as anything Plumb has ever recorded. Personally, I think that the song is about overcoming fear and asking God to protect us from the devil and the forces at work against us, so that our sleep is sweet and not troublesome for us, a welcome topic for Plumb as the album nears its conclusion. And speaking about the end, the final two songs on Exhale is just as powerful and epic as the previous offerings. “When You Walk Into The Room”, featuring hand claps, a strong and powerful vocal and a stripped back acoustic presence, is a continuation of “Great Is Our God” thematically, and speaks about how God changes the atmosphere of any situation for His glory when He is actively working in it, with the praises culminating in the epic chorus as Plumb reminds us that ‘…we love You, we’ll never stop, can’t live without You Jesus, we love You, and we can’t get enough, all this if for You Jesus…’. “Restored” is an emphatic, powerful statement, and a fitting song to end the album, as Plumb vividly recounts that God has restored her life, that ‘…my heart is so full, my cup overflows, what once was so fractured has been restored and You overcome all I cannot…’. Well done Tiffany for this compelling album that demands a second, third, and countless more listens to appreciate the beauty and layers in these personal yet worshipful melodies that are sure to bring healing and restoration to many. “…God has taught me what true redemption is. That no matter what we have done or do, He can use anything and wastes nothing and make true beauty from our ash. That although He doesn’t need us, He wants us. So His plan will be carried out no matter what, that it’s us that misses out, not the Kingdom, when we aren’t living in relationship with Him. So there is freedom to be human and not be okay and trust the God of infinite chances to brush off the dust of the messes we make, and let us begin again as many times as we need…” The deluxe edition tracks “We Stand For You”, a CCM/pop worship melody led by keys, depicting how we actively follow Jesus and stand for Him because of what He has done on the cross; and the epic and orchestral like worship anthem “You Are Enough” a vulnerable and stirring piano led song about how God is enough for us in any situation; both highlight what we already know; that Plumb’s prowess as a songwriter and singer is one of the best in the industry right now! With such a smorgasbord and myriad of relevant topics explored and musical genres delved into; there is something on Exhale for everyone! 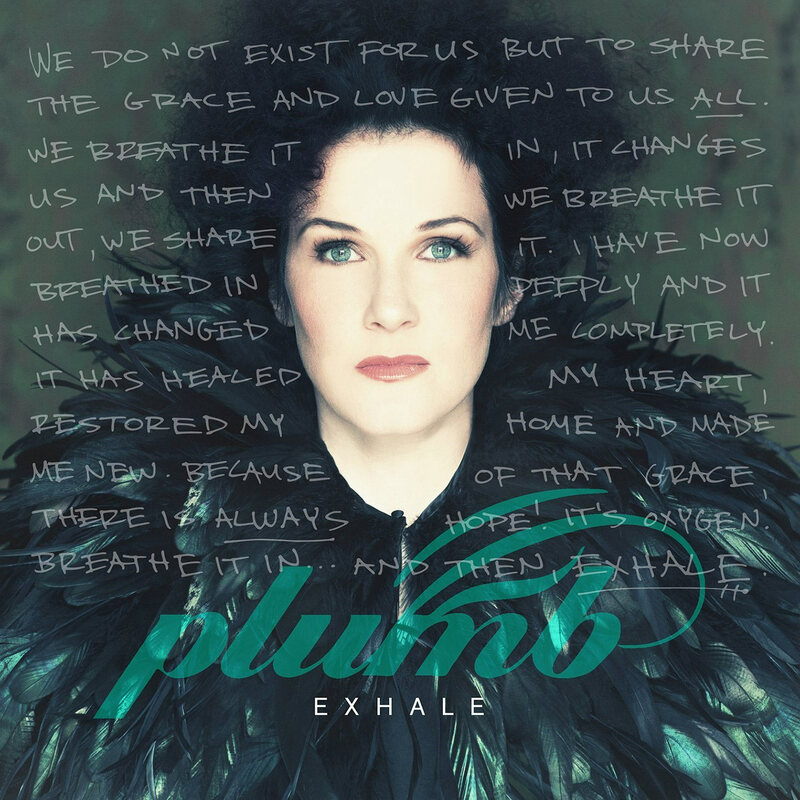 With plenty of rockers, ballads, vertical worship songs, remix material and dance material to satisfy many types of listeners, Plumb’s Exhale is certain to be up for many Dove Awards in the near future, and as one of the most anticipated albums in early 2015, the Curb Records artists’ new album is certainly worth the wait! Plumb has previously hinted at a Christmas album further on in the year or next year (which is pretty awesome), but until then, let’s just enjoy Exhale for now, and bask in the presence of God as we breathe in His presence and exhale his love to everyone we meet! 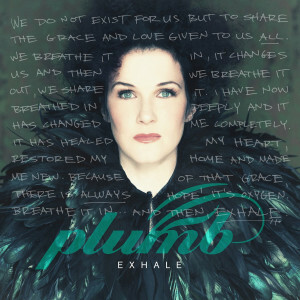 Be sure to check out Plumb’s new album Exhale in stores now! Also, check out Plumb’s lyric videos of the songs ‘Lord I’m Ready Now’, ‘Smoke’ and ‘Great Is Our God’! I love this album so much. I love the message behind the album being Restoration, Resurrection, Redemption and Reconciliation. It is an album of hope, the lyrics of the songs give strength to the listener. It is the type of album that makes me remember the definition of worship(from Luc M’s mom) as love responding to love. I have had the whole album on repeat since I got it. My favorite songs in the album are Great Is Our God, Smoke(I loved this song more when I saw that she wrote it Eric Marshall, lead singer of Young Oceans), Sleep Will Be Sweet, My True Love, We Stand For You, Restored and When You Walk Into The Room(when I first heard Bryan and Katie Torwalt’s version, I never thought I would love another version of the song, but Plumb proved me wrong). My final comment is that this album is awesome and this is an excellent review. Thanks Mercy for the compliment! Glad you like the review! I think Plumb’s new album is my favourite album of 2015! the remaining 4 in my top 5 are albums from Christy Nockels, Vertical Church Band, I Am They and Kevin Max! Plumb’s album is of course now in my top 5 and I love the other mentioned albums but I’d say that Christy’s album is exceptional. By the way, I was listening to I Am They last week and it felt like new music to my ears again. It’s getting hard for me to have a top 5 list and I know it’s a good feeling.